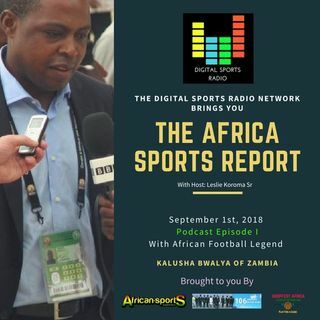 In one of our Flagship Programs: 'The Africa Sports Report' we bring you an Interview With African Football Legend Kalusha Bwalya who is though currently accused and banned for 2 years by FIFA stands tall as one of Africa's legendary footballers. Kalusha discusses a number of issues dealing with the dynamics of football on the continent and its pitfalls. A legend who traversed the globe plying his craft he talks about the painful tragedy of losing an entire national team back ... See More in 1993 when the whole Zambian team died in a plane crash off the Coast of Gabon to which he was the only survivor. Today a few years after this interview Kalusha talks about issues that are very prevalent in football across the continent today. Follow our weekly Podcast as we bring you insightful interviews and discussions on sports topics that addresses issues that are near and dear to you our audience.